Our love of all things sourdough is well documented. And why not? The long rise time results in a number of benefits that aren’t available in “quick breads” (those that rise using commercial yeast). Sourdough has a lower glycemic index rating, almost no phytic acid (which messes with your body’s ability to absorb nutrients), and the bacteria that cause the fermentation break down the complex carbohydrates and proteins (including gluten) into much more easily digested pieces. So for Thanksgiving this year, I decided to add some sourdough rolls to the already heavy mix of breads and bread-type products on the table. 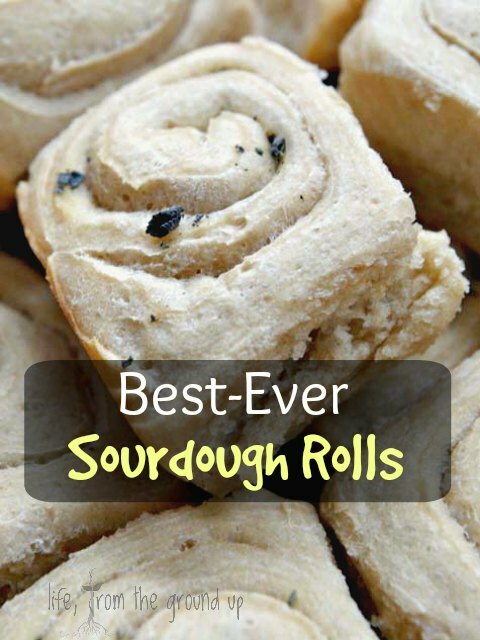 These sourdough rolls really are easy to whip up, and the waiting is the hardest part, so make sure you start these the night before (or early in the morning if they’re for dinner). 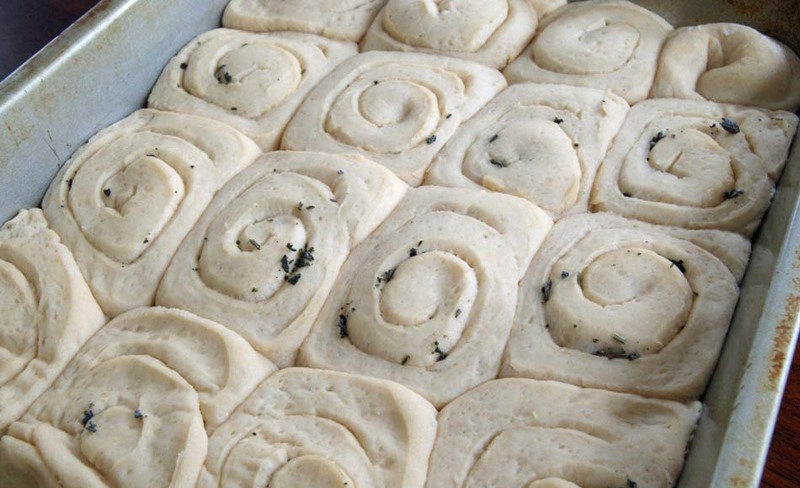 They’re also an actual roll, not just a blob of dough, so when you roll them up, you can put all kinds of seasoning inside. To start, mix 1/2 cup sourdough starter, about 3 cups of flour, a little sugar and salt, and 2/3 cup of water (may be a little more or less depending on how thick your starter is). Knead this for a good 8-10 minutes, or until the dough gets stretchy. Put it in a big bowl, cover, and let it sit for at least several hours, preferably overnight. On a lightly greased or floured surface, dump the dough and gently roll or pat the dough into a rough rectangle, maybe 1/2″ – 3/4″ thick. Spread the top with a little olive oil, then sprinkle in your favorite dried herbs or spices (I used a little sage and rosemary). 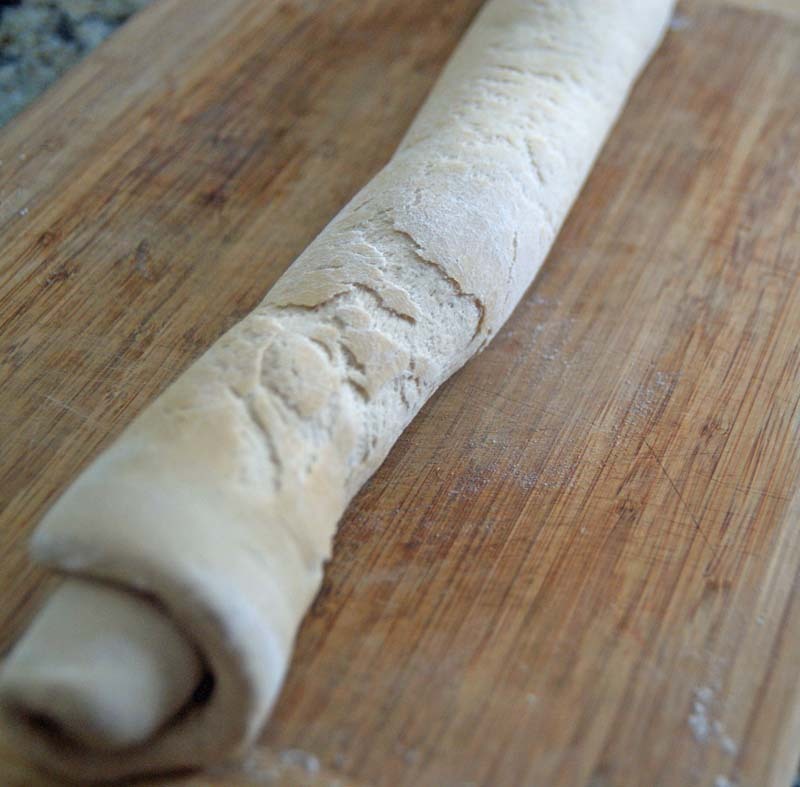 Roll the dough up longways, then cut the log into ~1″ slices. Grease a 9″ pan and lay the rolls into the pan. Let them rise for another hour in a warmish spot. Brush with some melted butter (optional), then pop them into a 350 F oven for 20-22 minutes. And the most important step: enjoy! Combine the starter and water in a bowl and mix well. Add the flour, sugar and salt, and mix again. 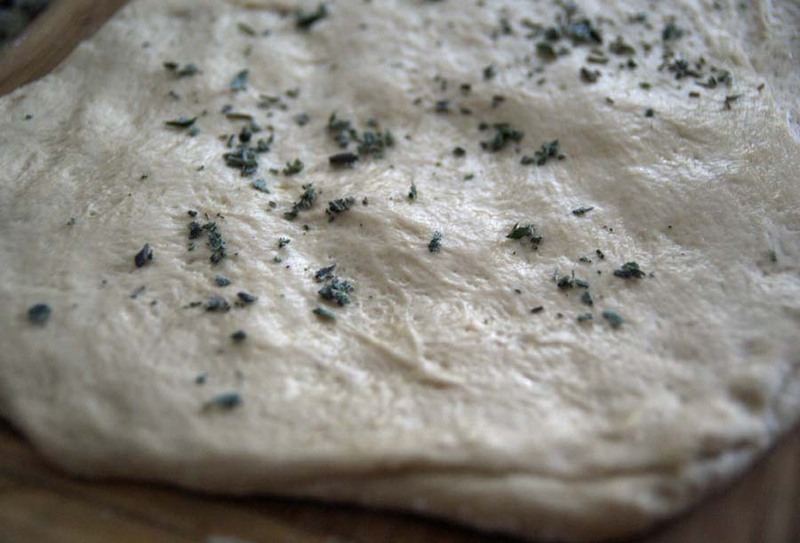 Dump the dough onto the counter and knead for 8-10 minutes, or until the dough is stretchy. Put the dough back into the bowl and let sit for 6-8 hours, or overnight. 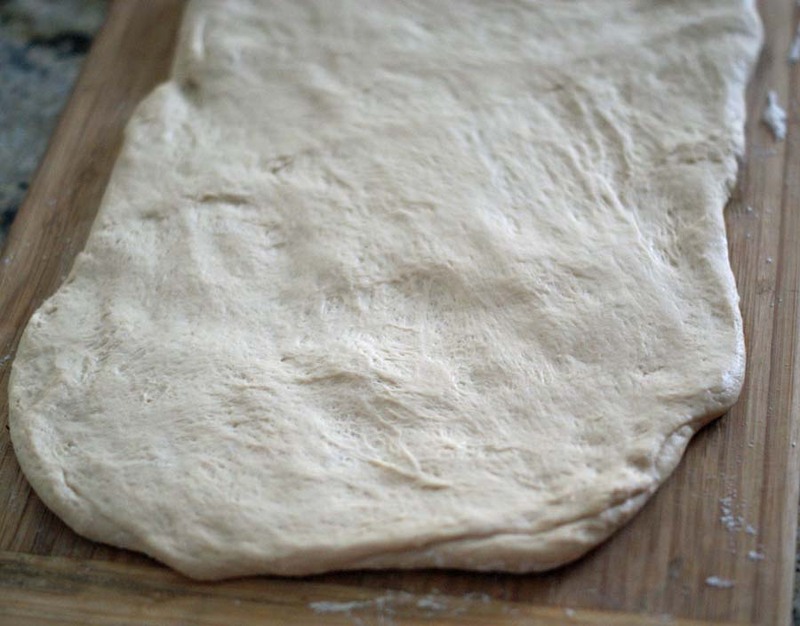 On a lightly floured surface, gently stretch and flatten the dough into a rough rectangle, 1/2" - 3/4" thick. Brush the top with oil or butter, then sprinkle with your preferred seasonings. Roll up lengthwise, then cut the log into 1" sections. Put the rolls into a lightly greased 9" pan (square or round). Let rise for about an hour, then preheat the oven to 350 F.
Brush with additional butter if desired, then bake for 20-22 minutes. Let cool and dig in. 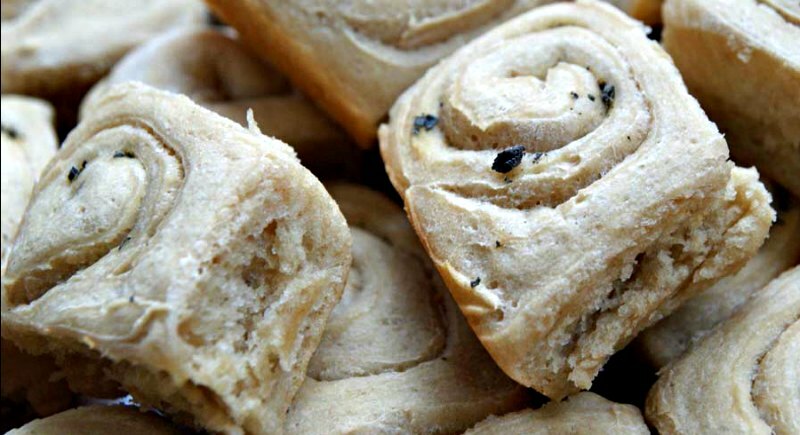 At first I thought these were cinnamon rolls and I was definitely going to tell my husband to make them (he’s the sourdough expert in our household) for Christmas morning. Then I realized they aren’t cinnamon, but totally could be. So I’m still going to tell him to make cinnamon rolls. Thanks for the idea, if inadvertent.